"AX.25 style Packet Radio is dead".That's what the old timers will tell you. They'll tell you it gave way to the Internet because the speeds were better and you didn't have to modify your rig. They may be right in that statement but when you're in a Red Cross shelter with no network access Packet Radio may be your only way to move that pile of ICS213 forms that have just arrived at your station. In my search for a modern Terminal Node Controller (fancy term for data modem) I've looked at all sorts of designs. Readers of my blog will be familiar with my various attempts to find something that will connect to the USB port of a modern PC/Laptop for OEM type uses. I _think_ I've found it. 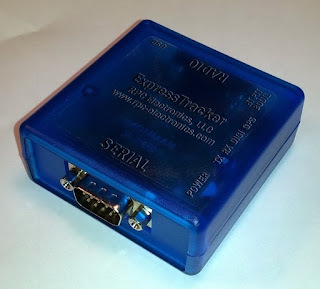 Say "hello" to the Express Tracker from RPC-Electronics. It's a small translucent box that's not quite as big as a packet of cigarettes. It can do APRS tracking when fitted with a GPS RX, act as a APRS Digipeater and most importantly for my needs has a _full_ KISS implementation. KISS? What's that? I'm not gonna go into that here but suffice to say that it's a way of using a radio modem without all the overhead of a Terminal Node Controller getting in the way. Go here for more about KISS. KISS is interesting to me (and hopefully you too) because it presents a standard interface that many software packages can talk to. So in my scenario I foresee our local ham club deployed at Red Cross shelters across the town after a severe storm. The local OEM has requested that all traffic be submitted digitally via ICS213 and similar forms. The problem is that there is little to no power to run email and fax machines etc. Enter Packet Radio. It'll run from your laptop and use the same power supply you are running your station from. I'm not going into how you would operate your chosen package or why this one is better than that one. What I will do is show you how to add your Express Tracker to your Windows and Linux PC's. Mac users _may_ be able to follow the Linux instructions. OK, Windows first. We are going to use AGWPE to attach to the ET. It's all trivial really. Plug in the USB cable and install the drivers if necessary. Then fire up AGWPE and configure your TNC as below. Your port number may be different to mine. Click OK and then restart AGWPE. So now you have AGWPE running your ET. Fire up your favourite packet application such as Outpost Packet Manager (pictured below) and configure it to use AGWPE. That's it. You're now on Packet Radio using your Express Tracker. Awesome article, Mark! Thanks for showing how versatile the ExpressTracker can be, outside of the APRS world. Bet you've never seen this before?